When it comes to highly effective riflescopes that can be used at anytime of the day or night, price seems to be an inevitable factor; the higher the price, the higher the quality. Recently, Sightmark has challenged this perception by introducing the Photon XT 4.6x42S Digital Night Vision Riflescope, which boasts of numerous features, and can definitely get the job done. We are happy to write a review for this remarkable scope, highlight its many features and specifications as well as answer some of the questions that potential buyers frequently ask with regard to the device. 1.10.1 Q. Who are the manufacturers of Sightmark Photon XT Digital Night Vision Riflescope? 1.10.2 Q. What’s the range of detection of the riflescope? 1.10.3 Q. Is the riflescope corrosion-resistant? 1.10.4 Q. What colors can I purchase the Sightmark Photon XT Digital Night Vision Riflescope in? 1.10.5 Q. How many digital reticle styles does the Sightmark Photon XT Digital Night Vision Riflescope have? 1.10.7 Q. What are the colors of the reticles of the Sightmark Photon XT Digital Night Vision Riflescope? 1.10.8 Q. Does the Sightmark Photon come with additional batteries? 1.10.9 Q. What is the weight of this device? 1.10.10 Q. Does the Sightmark Photon come with a warranty? 1.10.11 Q. What are the dimensions of the riflescope? 1.10.12 Q. Is the scope weatherproof? 1.10.13 Q. What’s the battery run time of the riflescope? 1.10.14 Q. Is the device shock-resistant? 1.10.15 Q. Besides the Sightmark Photon, what other things are included in the package? 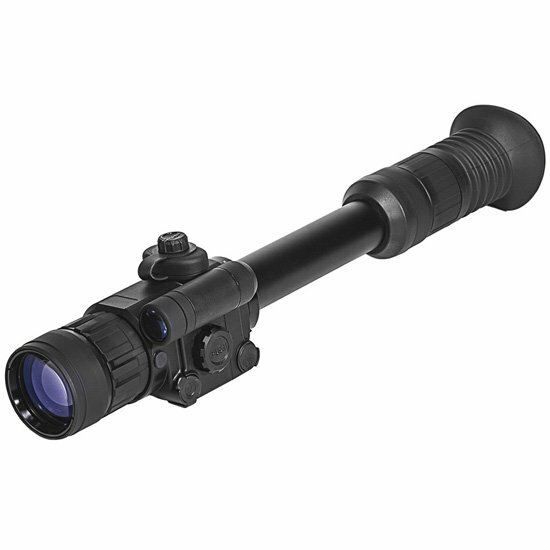 The scope is designed to provide you enough room for recoils. Most scopes don’t do a very good job in supporting recoil after you have taken a shot, and can cause a painful cut at the top of your eye upon impact. The scope’s eye relief, the distance between your eye and the rear lens of the scope, is 60mm. This is adequate room, which precludes impact. The Sightmark Photon comes with as many as six white/red/green reticle options that you can choose from so as to enhance precision. The Sightmark Photon comes with 2 Duplex reticles, which are perfect for varmint and hog hunting; 2 crossbow reticles, which are compatible with a number of crossbows such as 320, 350 and 370 fps crossbows; one German reticle made of extremely thick intersecting perpendicular lines that make it easier for you to shoot in low light and at moving targets; and one Mil-Dot reticle that is perfect for holdovers and rangefinding. Because of the biological make-up of the eyes, humans have been found to be less able to see well at night than some animals. But this can all change with a powerful device like the Sightmark Photon XT and its inbuilt 810nm LED IR illuminator that gives you the opportunity to see very clearly in total darkness. Thanks to the Sightmark Photon XT, you can now see your targets extremely clearly with minimal problems. The Sightmark’s very impressive 640×480 resolution enhances contrasts and provides a vivid image of your target, thereby significantly increasing your likelihood of hitting the target. With the Sightmark Photon’s video output feature, you can easily capture anything that you see both during the day and at night. This means that you can record all your adventures in the field and bring them back home to share with your friends and families. With this feature, you don’t need to do any unnecessary guesswork or complex calculations when sighting with your weapon. Windage means moving your point of view left or right, and elevation means moving your point of view up or down. The digital windage and elevation system not only takes away the manual work from positioning your rifle, it also allows you to be very exact in your positioning. An accurate position ensures accurate targeting and, ultimately, bounty catch. The scope comes with a carrying case. It comes with a lens cloth. It is both weatherproof and shockproof. The scope has a high battery life of up to 5 hours, which is 33% longer than most scopes of similar quality. Despite being very durable, it is lightweight. The video output feature allows you to capture everything you see in the field, day or night. This device doesn’t come with a remote control. The scope comes in only one color, black. Q. Who are the manufacturers of Sightmark Photon XT Digital Night Vision Riflescope? A. The scope is manufactured by Sightmark, a US-based producer of state-of-the-art optics and accessories for the shooters. Some of the company’s other products include binoculars, magnifiers, flashlights, and prismatic sights. Q. What’s the range of detection of the riflescope? A. The scope’s detection range is 120m. A. Yes, the riflescope’s body is made of glass-nylon composite, which is corrosion-resistant. Q. What colors can I purchase the Sightmark Photon XT Digital Night Vision Riflescope in? A. Currently, you can purchase the Sightmark Photon in only one color, Black. Q. How many digital reticle styles does the Sightmark Photon XT Digital Night Vision Riflescope have? A. The scope comes preloaded with 6 digital reticle styles. They are 2 crossbow reticles, 2 duplex reticles, a mil-dot reticle, and a German style reticle. A. Yes, it comes with a black carrying case. Q. What are the colors of the reticles of the Sightmark Photon XT Digital Night Vision Riflescope? A. The scope’s reticles come in three different colors, Red, Green and White. Q. Does the Sightmark Photon come with additional batteries? A. No, the riflescope doesn’t have additional batteries in the pack. Q. What is the weight of this device? A. The riflescope weighs 23.60oz. Q. Does the Sightmark Photon come with a warranty? A. Yes, the riflescope comes with a limited 3-year warranty. A. It has a measurement of 17.5x4x3.5inches. Q. Is the scope weatherproof? A. Yes, the scope can be used under many different weather settings. Q. Is the device shock-resistant? A. Yes, the device is housed in glass-nylon composite, which is impact-resistant. Q. Besides the Sightmark Photon, what other things are included in the package? A. When you purchase the Sightmark Photon, included in the package are the following items: a Carrying Case, a Video Cable, a User Manual and a Lens Cloth. Having read the Sightmark Photon XT Digital Night Vision Riflescope review above, you can see that the scope’s numerous features, including long eye relief, varied IR illuminator, multiple reticles, and digital Windage and elevation adjustment system, make it one of the best buys in its price range. Indeed, if you are looking for a very versatile scope that combines quality and affordability, you should consider the Sightmark Photon XT Digital Night Vision Riflescope.